Baking bread has never looked easier and I am eager to try it. Also NAEYC says that baking bread encourages many different kinds of learning in children so I want to practice so that I can bake with Emma one day. To begin I am going to try a simple recipe for No-Knead Bread. I don’t actually have a pot or anything to bake it in so I have been researching that too. Of course I would love to invest in a Le Creuset piece because they are so beautiful and heirloom quality and all that but they are also sooo expensive. Probably purchase a Lodge cast iron or colored enamel dutch oven instead. The all black cast iron does not have a problem with the knobs, or so I have read, so the cheaper one seems to be the better choice. And dutch ovens are so handy for everything! Baking bread sounds so wonderful so I am gonna do it! I have been so spoiled when it comes to buying artisanal bread in Berkeley. Do I get Acme fresh daily (pain de mie is my favorite) or buy a sliced loaf from nearby Bread Workshop? We love their bread makers and so many of their items (french white batards, asiago rolls, aleppo pepper rounds, pretzles, baguettes!) but its just too draining to go in there (unless Luisa is there ^_^ ). Semifreddi’s has excellent challah and the cinnamon kind is off the hook but for everyday bread I am want something that makes a good egg-in-a-hole. I have been getting loaves of Metropolis Baking Company’s Polynesian Brand bread from the Country Cheese Co. and its pretty good for that purpose. Not sure where my bread baking adventures will lead me. Hoping that I can slice my bread into good pieces. But then I realize I don’t have a good cutting board or bread knife. *_* Anyone have any tips for bread making or the items that I will need? The internet has so many good recipes that I want to start baking right away! Love that internet. 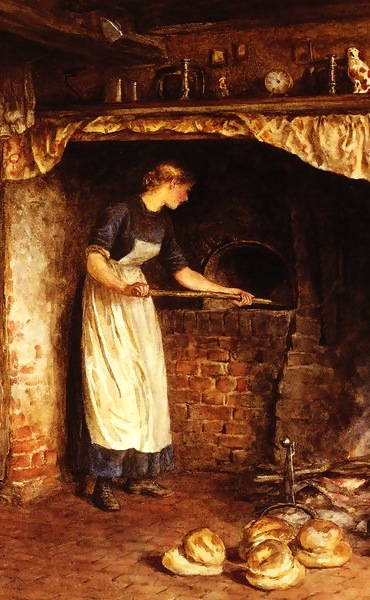 artwork Baking Bread by Helen Mary Elizabeth Allingham, R.W.S.